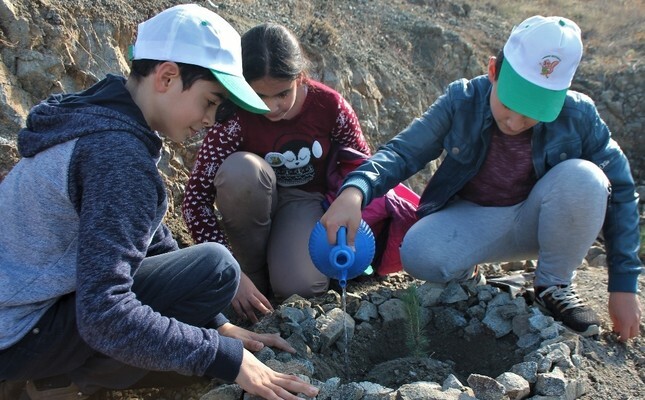 Students in the eastern province of Elazığ planted saplings as part of the campaign. School children in Turkey's 81 provinces planted tree saplings yesterday as part of the "Saplings Grow With Saplings" campaign, launched by President Recep Tayyip Erdoğan. The campaign, organized by the education and forestry ministries, is part of the country's latest afforestation drive. Amid a construction boom and concerns over global warming, Turkey has stepped up efforts to preserve and further expand its forests. Between 2007 and 2011, more than 4 billion saplings were planted and with more than 300 million saplings planted in the last year alone. In March, President Erdoğan had undertaken a similar campaign. The Presidency sent 23 million letters to the public in envelopes containing a seed and a call by the president to plant trees. Speaking as he helped plant a tree in Ankara's Yenimahalle district, Erdoğan said the project looks to give each student "a sapling dedicated to them." "As the saplings grow, they will grow too and in the future, we will have forests here. I believe this will instill children with awareness on environmental protection," he said. Erdoğan added that in the 16 years of Justice and Development (AK) Party rule some 4.07 billion saplings were planted with plans for up raising that number to 7 billion. He said Turkey produces some 350 million saplings annually and was a "world leader in the fight against erosion."